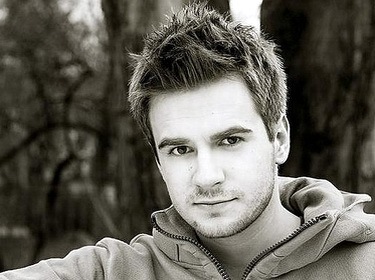 Marcin Mrozinski is a 24 year old singer and actor. Besides singing he also writes and composes his own songs. He graduated the Aleksander Zelwerowicz State Academy of Drama in Warsaw (main Drama School in Poland). His debut was at the age 8 in a children's program 5-10-15. He took part in almost all children's song contests in Poland and every time he achieved top scores. In 1997 he won a very prestigious competition вЂ“ National French Song Contest (in Radziejow) and he was rewarded with the first prize. He was representing Poland on 3rd International Festival "Singing Mask" and he came back with 2nd prize. In 1998 he started working for polish television as host in the popular music show "Songowanie na ekranie". He was also one of semi finalists of polish version of popular "Idol" and winner of show "Szansa na sukces" on TVP2. Since than, he is successfully working as an actor and singer. In 2007, he appeared at the Festival in Opole in concert "Niebo z moich stron" devoted to the work of Seweryn Krajewski, where he performed the song "Czy slyszysz co mСѓwie". Last year he participated in two musical super-productions in Poland вЂ“ "The Phantom of The Opera" (A. L. Webber) вЂ“ Raoul de Chagny and "Boyband" (Peter Quilter) - Sean. He recorded album with Original Polish Cast of "The Phantom of The Opera" as Raoul de Chagny. This year he become a host of a Cartoon Network production "Staraoke" (recorded in MTV studio's in London). He was cast to the special "Notre Dame l'Histoire" concert based on musical "Notre Dame de Paris" (Luc Plamondon) вЂ“ Clopin. From September 2009 one is able to see Mrozinski in certain sections of the program "Jaka to melodia?" where he sings the hits of the stars. Now, he is working on his first solo album. Watch the video of the national final performance here and preview video here. Website marcinmrozinski.com, MySpace РњР°СЂС†РёРЅ РњСЂРѕР·РёРЅСЃРєРё - 24С… Р»РµС‚РЅРёР№ РїРµРІРµС† Рё Р°РєС‚РµСЂ. РџРѕРјРёРјРѕ РїРµРЅРёСЏ РѕРЅ С‚Р°РєР¶Рµ СЏРІР»СЏРµС‚СЃСЏ Р°РІС‚РѕСЂРѕРј СЃРѕР±СЃС‚РІРµРЅРЅС‹С… РјСѓР·С‹РєР°Р»СЊРЅС‹С… РїСЂРѕРёР·РІРµРґРµРЅРёР№. РћРЅ Р·Р°РєРѕРЅС‡РёР» Р“РѕСЃСѓРґР°СЂСЃС‚РІРµРЅРЅСѓСЋ РўРµР°С‚СЂР°Р»СЊРЅСѓСЋ РђРєР°РґРµРјРёСЋ РёРј. РђР»РµРєСЃР°РЅРґСЂР° Р—РµР»РІРµСЂРѕРІРёС‡Р° РІ Р’Р°СЂС€Р°РІРµ. Р•РіРѕ РґРµР±СЋС‚ СЃРѕСЃС‚РѕСЏР»СЃСЏ РІ РІРѕР·СЂР°СЃС‚Рµ 8 Р»РµС‚ РІ РґРµС‚СЃРєРѕР№ РїСЂРѕРіСЂР°РјРјРµ 5-10-15. РћРЅ РїСЂРёРЅСЏР» СѓС‡Р°СЃС‚РёРµ РїСЂР°РєС‚РёС‡РµСЃРєРё РІРѕ РІСЃРµС… РґРµС‚СЃРєРёС… С€РєРѕР»СЊРЅС‹С… РєРѕРЅРєСѓСЂСЃР°С… РІ РџРѕР»СЊС€Рµ. Р’ 1997 РіРѕРґСѓ РѕРґРµСЂР¶Р°Р» РїРѕР±РµРґСѓ РЅР° РѕС‡РµРЅСЊ РїСЂРµСЃС‚РёР¶РЅРѕРј РєРѕРЅРєСѓСЂСЃРµ РІ Р Р°РґР·РµР№РѕРІРµ. РџСЂРµРґСЃС‚Р°РІРёР» РџРѕР»СЊС€Сѓ РЅР° С‚СЂРµС‚СЊРµРј РјРµР¶РґСѓРЅР°СЂРѕРґРЅРѕРј С„РµСЃС‚РёРІР°Р»Рµ "Singing Mask", РіРґРµ Р·Р°РЅСЏР» РІС‚РѕСЂРѕРµ РјРµСЃС‚Рѕ. Р’ С‚РµС‡РµРЅРёРё С‡РµС‚С‹СЂРµС… Р»РµС‚ СЂР°Р±РѕС‚Р°Р» РІ РїСЂРѕРіСЂР°РјРјРµ "Songowanie na ekranie" РєР°РЅР°Р»Р° TVP1. РџСЂРёРЅРёРјР°Р» СѓС‡Р°СЃС‚РёРµ РІ РїРµСЂРІРѕРј РІС‹РїСѓСЃРєРµ РџРѕР»СЊСЃРєРѕР№ РІРµСЂСЃРёРё С€РѕСѓ Idol. РЇРІР»СЏРµС‚СЃСЏ РїРѕР±РµРґРёС‚РµР»РµРј С€РѕСѓ "Szansa na sukces" РЅР° РєР°РЅР°Р»Рµ TVP2 Рё РїРѕР»СѓС„РёРЅР°Р»РёСЃС‚РѕРј С‚СЂРµС‚СЊРµРіРѕ РІС‹РїСѓСЃРєР° Р�РґРѕР»Р°. РЎ С‚РѕР№ РїРѕСЂС‹ СѓСЃРїРµС€РЅРѕ СЂР°Р±РѕС‚Р°РµС‚ РІ РєР°С‡РµСЃС‚РІРµ РїРµРІС†Р° Рё Р°РєС‚РµСЂР°. Р’ 2007 РіРѕРґСѓ РїСЂРёРЅСЏР» СѓС‡Р°СЃС‚РёРµ РІ РєРѕРЅС†РµСЂС‚Рµ "Niebo z moich stron" РІ СЂР°РјРєР°С… С„РµСЃС‚РёРІР°Р»СЏ РІ РћРїРѕР»Рµ, РїРѕСЃРІСЏС‰РµРЅРЅРѕРіРѕ С‚РІРѕСЂС‡РµСЃС‚РІСѓ РЎРµРІРµСЂРёРЅР° РљСЂР°РµРІСЃРєРѕРіРѕ, РіРґРµ РёСЃРїРѕР»РЅРёР» РїРµСЃРЅСЋ "Czy slyszysz co mСѓwie". Р—Р° РїРѕСЃР»РµРґРЅРёР№ РіРѕРґ РїСЂРёРЅСЏР» СѓС‡Р°СЃС‚РёРµ РІ РґРІСѓС… С‚РµР°С‚СЂР°Р»СЊРЅС‹С… РїРѕСЃС‚Р°РЅРѕРІРєР°С… - "РџСЂРёР·СЂР°Рє РћРїРµСЂС‹", РіРґРµ РёСЃРїРѕР»РЅРёР» СЂРѕР»СЊ Р Р°СѓР»СЏ Рё "Boyband" РџРёС‚РµСЂР° РљРІРёР»С‚РµСЂР°, РіРґРµ СЃС‹РіСЂР°Р» РЁРѕРЅР°. Р—Р°РїРёСЃР°Р» РєРѕРЅС†РµРїС‚ Р°Р»СЊР±РѕРј РїРѕР»СЊСЃРєРѕР№ РІРµСЂСЃРёРё "РџСЂРёР·СЂР°РєР° РћРїРµС‚С‹". Р’ СЌС‚РѕРј РіРѕРґСѓ СЃС‚Р°Р» РІРµРґСѓС‰РёРј РїСЂРѕРіСЂР°РјРјС‹ "Staraoke" РЅР° РєР°РЅР°Р»Рµ Cartoon Network (СЃСЉРµРјРєРё РєРѕС‚РѕСЂРѕР№ РїСЂРѕС…РѕРґСЏС‚ РІ СЃС‚СѓРґРёРё MTV РІ Р›РѕРЅРґРѕРЅРµ). Р‘С‹Р» РїСЂРёРіР»Р°С€РµРЅ РїСЂРёРЅСЏС‚СЊ СѓС‡Р°СЃС‚РёРµ РІ СЃРїРµС†РёР°Р»СЊРЅРѕРј РєРѕРЅС†РµСЂС‚Рµ "Notre Dame l'Histoire", РѕСЃРЅРѕРІР°РЅРЅРѕРј РЅР° РјСЋР·РёРєР»Рµ Р›СЋРєР° РџР»Р°РјРѕРЅРґРѕРЅР° "Notre Dame De Paris", РіРґРµ РёСЃРїРѕР»РЅРёР» СЂРѕР»СЊ РљР»РѕРїРµРЅР°. РЎ СЃРµРЅС‚СЏР±СЂСЏ 2009 РіРѕРґР° РњСЂРѕР·РёРЅСЃРєРѕРіРѕ РјРѕР¶РЅРѕ Р±С‹Р»Рѕ СѓРІРёРґРµС‚СЊ РІ РїСЂРѕРіСЂР°РјРјРµ "РЈРіР°РґР°Р№ РјРµР»РѕРґРёСЋ", РіРґРµ РѕРЅ РёСЃРїРѕР»РЅСЏР» РёР·РІРµСЃС‚РЅС‹Рµ С…РёС‚С‹. Р’ РЅР°СЃС‚РѕСЏС‰РµРµ РІСЂРµРјСЏ СЂР°Р±РѕС‚Р°РµС‚ РЅР°Рґ РґРµР±СЋС‚РЅС‹Рј Р°Р»СЊР±РѕРјРѕРј. РџРѕСЃРјРѕС‚СЂРµС‚СЊ РІРёРґРµРѕ РІС‹СЃС‚СѓРїР»РµРЅРёСЏ РЅР° РЅР°С†РёРѕРЅР°Р»СЊРЅРѕРј РѕС‚Р±РѕСЂРµ РјРѕР¶РЅРѕ Р·РґРµСЃСЊ Рё РїСЂРµРІСЊСЋ РІРёРґРµРѕ Р·РґРµСЃСЊ. wanna see my princess much closer. feeling this love 'till the day when I die. take my hand and say that you love me. Running order of Polish national preselection has been determined, you can watch drawing ceremony video here. The televoting number for SMS vote has been announced: x to 7350, where x is number from 1 to 10. Cost of SMS is 3.66 zl. incl. VAT. Music videos for all 10 entries can be seen here. As earlier announced, national final of Polish preselection will be hosted by Aleksandra Rosiak, hostess of popular morning show "Kawa czy herbata?" and Artur Orzech, music journalist. Guests of the show will be Edyta GГіrniak and MieczysЕ‚aw SzczeЕ›niak. Final will be broadcasted on Valentine's Day 14th of February at 20.15 on TVP1 and TVP Polonia. Valentine wishes sent by viewers by SMS will be displayed on screens throughout the show. РћРїСЂРµРґРµР»РµРЅ РїРѕСЂСЏРґРѕРє РІС‹СЃС‚СѓРїР»РµРЅРёР№ РІ РїРѕР»СЊСЃРєРѕРј РЅР°С†РёРѕРЅР°Р»СЊРЅРѕРј РѕС‚Р±РѕСЂРµ, С†РµСЂРµРјРѕРЅРёСЋ Р¶РµСЂРµР±СЊРµРІРєРё РІС‹ РјРѕР¶РµС‚Рµ СѓРІРёРґРµС‚СЊ Р·РґРµСЃСЊ. РћР±СЉСЏРІР»РµРЅ РЅРѕРјРµСЂ РґР»СЏ РЎРњРЎ РіРѕР»РѕСЃРѕРІР°РЅРёСЏ: x РЅР° 7350, РіРґРµ x - РїРѕСЂСЏРґРєРѕРІС‹Р№ РЅРѕРјРµСЂ РѕС‚ 1 РґРѕ 10. РЎС‚РѕРёРјРѕСЃС‚СЊ РЎРњРЎ 3.66 Р·Р». СЃ РќР”РЎ. Р’РёРґРµРѕРєР»РёРїС‹ РЅР° 10 СѓС‡Р°СЃС‚РІСѓСЋС‰РёС… РєРѕРјРїРѕР·РёС†РёР№ РјРѕР¶РЅРѕ СѓРІРёРґРµС‚СЊ Р·РґРµСЃСЊ. РљР°Рє СЂР°РЅРµРµ СЃРѕРѕР±С‰Р°Р»РѕСЃСЊ, РІРµРґСѓС‰РµР№ РЅР°С†РёРѕРЅР°Р»СЊРЅРѕРіРѕ РїРѕР»СЊСЃРєРѕРіРѕ РѕС‚Р±РѕСЂР° СЃС‚Р°РЅРµС‚ РђР»РµРєСЃР°РЅРґСЂР° Р РѕСЃСЏРє, РІРµРґСѓС‰Р°СЏ РїРѕРїСѓР»СЏСЂРЅРѕРіРѕ СѓС‚СЂРµРЅРЅРµРіРѕ С€РѕСѓ "Kawa czy herbata?" Рё РђСЂС‚СѓСЂ РћСЂС†РµС…, РјСѓР·С‹РєР°Р»СЊРЅС‹Р№ Р¶СѓСЂРЅР°Р»РёСЃС‚. Р“РѕСЃС‚СЏРјРё С€РѕСѓ Р±СѓРґСѓС‚ Edyta GГіrniak Рё MieczysЕ‚aw SzczeЕ›niak. Р¤РёРЅР°Р» Р±СѓРґРµС‚ С‚СЂР°РЅСЃР»РёСЂРѕРІР°С‚СЊСЃСЏ РІ Р”РµРЅСЊ РЎРІСЏС‚РѕРіРѕ Р’Р°Р»РµРЅС‚РёРЅР° 14РіРѕ С„РµРІСЂР°Р»СЏ РІ 20.15 РјРµСЃС‚РЅРѕРіРѕ РІСЂРµРјРµРЅРё РЅР° TVP1 Рё TVP Polonia. РџРѕР·РґСЂР°РІР»РµРЅРёСЏ Р·СЂРёС‚РµР»РµР№ СЃ РїСЂР°Р·РґРЅРёРєРѕРј, РѕС‚РїСЂР°РІР»РµРЅРЅС‹Рµ РїРѕСЃСЂРµРґСЃС‚РІРѕРј РЎРњРЎ Р±СѓРґСѓС‚ РґРµРјРѕРЅСЃС‚СЂРёСЂРѕРІР°С‚СЃСЏ РЅР° СЌРєСЂР°РЅРµ РЅР° РїСЂРѕС‚СЏР¶РµРЅРёРё РІСЃРµРіРѕ С€РѕСѓ. TVP Poland has announced that the list wildcard is being given to the song of Marcin Mrozinski "Legenda". The song has been heavily promoted recently by OGAE Poland and broadcaster has finally accepted it in the line-up. 10 artists will compete in Eurovision national final on 14th of February. TVP РџРѕР»СЊС€Р° РѕР±СЉСЏРІРёР»Рѕ Рѕ С‚РѕРј, С‡С‚Рѕ РїРѕСЃР»РµРґРЅСЏСЏ РІР°Р№Р»РґРєР°СЂС‚Р° Р±С‹Р»Р° РѕС‚РґР°РЅР° РїРµСЃРЅРµ "Legenda" РІ РёСЃРїРѕР»РЅРµРЅРёРё Marcin Mrozinski. РџРµСЃРЅСЋ С€РёСЂРѕРєРѕ РїСЂРѕРїР°РіР°РЅРґРёСЂРѕРІР°Р» РєР»СѓР± РћР“РђР• РџРѕР»СЊС€Рё Рё, РЅР°РєРѕРЅРµС†, РѕРЅР° Р±С‹Р»Р° РІРєР»СЋС‡РµРЅР° РІ СЃРѕСЃС‚Р°РІ СѓС‡Р°СЃС‚РЅРёРєРѕРІ РЅР°С†РёРѕРЅР°Р»СЊРЅРѕРіРѕ РѕС‚Р±РѕСЂР°. 10 Р°СЂС‚РёСЃС‚РѕРІ РїСЂРёРјСѓС‚ СѓС‡Р°СЃС‚РёРµ РІ С„РёРЅР°Р»Рµ 14РіРѕ С„РµРІСЂР°Р»СЏ. At the moment, there are 9 contenders in the Polish national preselection. Iwona WД™growska - composer, songwriter, vocalist with 4-octave voice. Collaborates with other composers such as Martin Berammer and Gary Clark, who previously worked with James Morrison, Emma Bunton, Natalie Imbruglia, Rachel Stevens and Gareth Gates. In Poland, she sang with band Feel in projects of Piotr Rubik. Leszcze - a band from Trojmiasto which debuted in 2001 with album "Wolne Miasto Dancing", which included such songs as "Usta jak maliny" and "Irena". Biggest hit of the band -" Ta dziewczyna" was awarded Journalists award at 39th Opole festival. In 2003 the band released an album "Kombinuj dziewczyna". Р’ РЅР°СЃС‚РѕСЏС‰РµРµ РІСЂРµРјСЏ РІ СЃРїРёСЃРєРµ С„РёРЅР°Р»РёСЃС‚РѕРІ РїРѕР»СЊСЃРєРѕРіРѕ РѕС‚Р±РѕСЂР° Р·РЅР°С‡Р°С‚СЃСЏ 9 РєРѕРјРїРѕР·РёС†РёР№. Iwona WД™growska - РєРѕРјРїРѕР·РёС‚РѕСЂ, Р°РІС‚РѕСЂ РїРµСЃРµРЅ, РІРѕРєР°Р»РёСЃС‚РєР° СЃ РіРѕР»РѕСЃРѕРј РІ 4 РѕРєС‚Р°РІС‹. РЎРѕС‚СЂСѓРґРЅРёС‡Р°РµС‚ СЃ РґСЂСѓРіРёРјРё РєРѕРјРїРѕР·РёС‚РѕСЂР°РјРё, С‚Р°РєРёРјРё РєР°Рє РњР°СЂС‚РёРЅ Р‘РµСЂР°РјРјРµСЂ Рё Р“Р°СЂРё РљР»Р°СЂРє, РєРѕС‚РѕСЂС‹Рµ СЂР°РЅСЊС€Рµ СЂР°Р±РѕС‚Р°Р»Рё СЃ Р”Р¶РµР№РјСЃРѕРј РњРѕСЂСЂРёСЃРѕРЅРѕРј, Р­РјРјРѕР№ Р‘Р°РЅС‚РѕРЅ, РќР°С‚Р°Р»Рё Р�РјР±СЂСѓРіР»РёРµР№, Р СЌР№С‡РµР» РЎС‚РёРІРµРЅСЃ Рё Р“Р°СЂРµС‚РѕРј Р“РµР№С‚СЃРѕРј. Р’ РџРѕР»СЊС€Рµ, РѕРЅР° РІС‹СЃС‚СѓРїР°Р»Р° СЃ РіСЂСѓРїРїРѕР№ Feel Рё РІ РїСЂРѕРµРєС‚Р°С… РџРµС‚СЂР° Р СѓР±РёРєР°. Leszcze - РіСЂСѓРїРїР° РёР· РўСЂСѓР№РјСЏСЃС‚Рѕ, РєРѕС‚РѕСЂР°СЏ РґРµР±СЋС‚РёСЂРѕРІР°Р»Р° РІ 2001 РіРѕРґСѓ СЃ Р°Р»СЊР±РѕРјРѕРј "Wolne Miasto Dancing", РІ РєРѕС‚РѕСЂС‹Р№ РІРѕС€Р»Рё С‚Р°РєРёРµ РїРµСЃРЅРё, РєР°Рє "Usta jak maliny" Рё "Irena". Р“Р»Р°РІРЅС‹Р№ С…РёС‚ РіСЂСѓРїРїС‹ "Ta dziewczyna" РїРѕР»СѓС‡РёР»Р° Р¶СѓСЂРЅР°Р»РёСЃС‚СЃРєСѓСЋ РїСЂРµРјРёСЋ РЅР° 39 С„РµСЃС‚РёРІР°Р»Рµ РІ РћРїРѕР»Рµ. Р’ 2003 РіРѕРґСѓ РіСЂСѓРїРїР° РІС‹РїСѓСЃС‚РёР»Р° Р°Р»СЊР±РѕРј "Kombinuj dziewczyna". ZoSia (Zosia Karbowiak) - РєРѕРјРїРѕР·РёС‚РѕСЂ, Р°РІС‚РѕСЂ С‚РµРєСЃС‚РѕРІ, РјСѓР»СЊС‚Рё-РёРЅСЃС‚СЂСѓРјРµРЅС‚Р°Р»РёСЃС‚ Рё РїСЂРѕРґСЋСЃРµСЂ. Р•Рµ РґРµР±СЋС‚РЅС‹Р№ Р°Р»СЊР±РѕРј "S.I.N.G." Р±С‹Р» РІС‹РїСѓС‰РµРЅ РІ РЎРЁРђ. РџСЂРѕРґСЋСЃРµСЂР°РјРё РґРёСЃРєР° Р±С‹Р»Рё Р»РµРіРµРЅРґР°СЂРЅС‹Рµ РјСѓР·С‹РєР°РЅС‚С‹ РіСЂСѓРїРїС‹ Chicago: Р”Р¶РµР№СЃРѕРЅ РЁРµС„С„ Рё Р РѕР±РµСЂС‚ Р›Р°РјРј. РћРЅР° РїСЂРёРЅРёРјР°Р»Р° СѓС‡Р°СЃС‚РёРµ РІ СЃРµРєС†РёРё "РџСЂРµРјСЊРµСЂС‹" С„РµСЃС‚РёРІР°Р»Рµ РІ РћРїРѕР»Рµ РІ 2009 РіРѕРґСѓ. 11/12 Band PIN has withdrawn their entry from Polish "Song For Europe" preselection. The following statement was made by the band explaining their withdrawal: "The need to modify the plans due to recordings of our third album and concert promotions forced us to give up our participation in the qualifying round for the Eurovision 2010. At the same time we thank the preselection commission appointed by TVP for the recognition of our work and classificiation of it to the final, it was the giant prize by itself. We wish all the best to the remaining candidatates at the Polish selection and with all our hearts we wish Poland victory in Oslo", stated members of the band. Earlier, Polish TVP has named 4 songs that will take part in the national preselection 2010 chosen from 122 submitted songs. Among them was "PINlady" that band PIN has recorded together with soprano singer Katarzyna Oles-Blacha from Krakow. It is also expected that channel will add some wildcards to complete line-up for the national final which will take place on February 14th. First wildcard already went to the band VIR. Members of preselection jury are: Wojciech Hoflik, Maria Szablowska, Pawel Sztompke, Krzysztof Szewczyk, Boleslaw Pawica, Artur Orzech, Marek Lamprecht, Piotr Klatt, Mikolaj Dobrowolski, Tomasz Deszczynski. TVP is still accepting proposals for the wildcards. Potential entries, complying with the section 3 of the rules of the preselection, should be sent in mp3 format to tomasz.solowinski@tvp.pl. Only Polish citizen can apply. Aneta Figiel was born on 2 June 1980 in Wloclawek. Since 1999 she performed in various musicals, including "Miss Saigon", "Peter Pan", "Grease" and "Chicago". She won TV show "Szansy na sukses" with band IRA. Took part in Opole festival in duet with Marzena Korzonek and with band Esoka. In 2003 took part in Polish "Idol" reaching the final 10. In 2006 won the contest "Przebojem na antene", organized by Polish radio. Dziewczyny (Girls) were established in 2008, initially as the girl duo of Anna Karamon and Aleksandra Novak with accompaniment of charismatic guitarist Krzysztof Lochowicz later also including extra musiciants. They had took part in various music festivals. In May 2009 twice won in "Hit Generator" show of TVP 2 and now are working on a debut album "Dziewczyny z sasiedztwa" to be released in March 2010. Anna Cyzon is Canadian Idol finalist and presenter of MTV Canada, where he conducted interviews with movie stars. She was born in Krakow, she moved to Canada with his parents being 6 years old. Her debut CD will be released in 2010. VIR band has been established in 2003 and is made of three musicians from Rzeszow: Mariusz Dlugosz, Tomek Tebin and Andrzej Ruzzal. Team members have a rich artistic experience gained in local bands: Latami, Ninie Walking Trees, Tea 4 Two, Varieze, Ptaki, K-15. Have recorded covers of Depeche Mode for the tribute album "Master of Celebration" and released own album "Nie wiem..." in 2005. Sonic Lake have been established in November 2006 and founding members are singer Julia Schiffer (semifinalist of German "Idol") and guitarist and composer Michael Pietrzak (worked among others with Goran Bregovic, Gorny Orchestra, Young Band etc). Nefer have been formed in 2006. Their same titled debut album has been released on 28th of January 2008. In July 2008 the band has performed as warm-up act for the Wroclaw concert of Avril Lavigne. More information on selected performers is available on TVP website (in Polish), you can listen to the participating songs here. Р“СЂСѓРїРїР° PIN СЃРЅСЏР»Р° Р·Р°СЏРІРєСѓ СЃ СѓС‡Р°СЃС‚РёСЏ РІ РїРѕР»СЊСЃРєРѕР№ "РџРµСЃРЅРµ РґР»СЏ Р•РІСЂРѕРїС‹". РЎР»РµРґСѓСЋС‰РµРµ Р·Р°СЏРІР»РµРЅРёРµ, РѕР±СЉСЏСЃРЅСЏСЋС‰РµРµ СЌС‚РѕС‚ РїРѕСЃС‚СѓРїРѕРє, Р±С‹Р»Рѕ СЃРґРµР»Р°РЅРѕ РѕС‚ Р»РёС†Р° РіСЂСѓРїРїС‹: "РќРµРѕР±С…РѕРґРёРјРѕСЃС‚СЊ РёР·РјРµРЅРёС‚СЊ РїР»Р°РЅС‹ РёР·-Р·Р° Р·Р°РїРёСЃРё РЅР°С€РµРіРѕ С‚СЂРµС‚СЊРµРіРѕ Р°Р»СЊР±РѕРјР° Рё РєРѕРЅС†РµСЂС‚РЅС‹С… СЂР°СЃРїРёСЃР°РЅРёР№ РІС‹РЅСѓР¶РґР°РµС‚ РЅР°СЃ РѕС‚РєР°Р·Р°С‚СЊСЃСЏ РѕС‚ СѓС‡Р°СЃС‚РёСЏ РІ РєРІР°Р»РёС„РёРєР°С†РёРѕРЅРЅРѕРј СЂР°СѓРЅРґРµ Рє Р•РІСЂРѕРІРёРґРµРЅРёСЋ 2010. Р’ С‚Рѕ Р¶Рµ РІСЂРµРјСЏ, РјС‹ Р±Р»Р°РіРѕРґР°СЂРёРј РѕС‚Р±РѕСЂРѕС‡РЅС‹Р№ РєРѕРјРјРёС‚РµС‚, РЅР°Р·РЅР°С‡РµРЅРЅС‹Р№ TVP Р·Р° РёС… РїСЂРёР·РЅР°РЅРёРµ РЅР°С€РµР№ СЂР°Р±РѕС‚С‹ Рё РѕС‚Р±РѕСЂ РµРµ РІ С‡РёСЃР»Рѕ СѓС‡Р°СЃС‚РЅРёРєРѕРІ С„РёРЅР°Р»Р°, РґР»СЏ РЅР°СЃ СЌС‚Рѕ Р±С‹Р»Рѕ РѕРіСЂРѕРјРЅС‹Рј РїСЂРёР·РѕРј СЃР°РјРѕ РїРѕ СЃРµР±Рµ. РњС‹ Р¶РµР»Р°РµРј РІСЃРµРіРѕ Р»СѓС‡С€РµРіРѕ РѕСЃС‚Р°РІС€РёРјСЃСЏ СѓС‡Р°СЃС‚РЅРёРєР°Рј РЅР°С†РёРѕРЅР°Р»СЊРЅРѕРіРѕ РѕС‚Р±РѕСЂР° Рё РѕС‚ РІСЃРµРіРѕ СЃРµСЂРґС†Р° Р¶РµР»Р°РµРј РџРѕР»СЊС€Рµ РїРѕР±РµРґС‹ РІ РћСЃР»Рѕ", Р·Р°СЏРІРёР»Рё С‡Р»РµРЅС‹ РіСЂСѓРїРїС‹. Р Р°РЅРµРµ, РїРѕР»СЊСЃРєРёР№ С‚РµР»РµРєР°РЅР°Р» TVP РЅР°Р·РІР°Р» 4 РїРµСЃРЅРё, РѕС‚РѕР±СЂР°РЅРЅС‹Рµ РёР· 122 Р·Р°СЏРІРѕРє РЅР° СѓС‡Р°СЃС‚РёРµ РІ РЅР°С†РёРѕРЅР°Р»СЊРЅРѕРј РѕС‚Р±РѕСЂРµ. РЎСЂРµРґРё РЅРёС… Р±С‹Р»Р° Рё "PINlady", РєРѕС‚РѕСЂСѓСЋ РіСЂСѓРїРїР° PIN Р·Р°РїРёСЃР°Р»Р° РІРјРµСЃС‚Рµ СЃ СЃРѕРїСЂР°РЅРѕ РїРµРІРёС†РµР№ Katarzyna Oles-Blancha РёР· РљСЂР°РєРѕРІР°. РћР¶РёРґР°РµС‚СЃСЏ, С‡С‚Рѕ С‚РµР»РµРєР°РЅР°Р» С‚Р°РєР¶Рµ РґРѕР±Р°РІРёС‚ Рє СЃРїРёСЃРєСѓ СѓС‡Р°СЃС‚РЅРёРєРѕРІ РЅР°С†РёРѕРЅР°Р»СЊРЅРѕРіРѕ С„РёРЅР°Р»Р°, РЅР°РјРµС‡РµРЅРЅРѕРіРѕ РЅР° 14 С„РµРІСЂР°Р»СЏ, СЂСЏРґ wildcard, РїРµСЂРІР°СЏ РёР· РєРѕС‚РѕСЂС‹С… СѓР¶Рµ СѓС€Р»Р° РіСЂСѓРїРїРµ VIR. Р§Р»РµРЅС‹ РѕС‚Р±РѕСЂРѕС‡РЅРѕРіРѕ Р¶СЋСЂРё: Wojciech Hoflik, Maria Szablowska, Pawel Sztompke, Krzysztof Szewczyk, Boleslaw Pawica, Artur Orzech, Marek Lamprecht, Piotr Klatt, Mikolaj Dobrowolski, Tomasz Deszczynski. TVP РІСЃРµ РµС‰Рµ РїСЂРёРЅРёРјР°РµС‚ Р·Р°СЏРІРєРё РЅР° РїРѕР·РёС†РёРё РІР°Р№Р»РґРєР°СЂРґРѕРІ. РџРѕС‚РµРЅС†РёР°Р»СЊРЅС‹Рµ РїРµСЃРЅРё, СѓРґРѕРІР»РµС‚РІРѕСЂСЏСЋС‰РёРµ 3РјСѓ СЂР°Р·РґРµР»Сѓ РїСЂР°РІРёР» РѕС‚Р±РѕСЂР°, РґРѕР»Р¶РЅС‹ РѕС‚СЃС‹Р»Р°С‚СЊСЃСЏ РІ С„РѕСЂРјР°С‚Рµ mp3 РЅР° Р°РґСЂРµСЃ tomasz.solowinski@tvp.pl. РЈС‡Р°СЃС‚РёРµ РїСЂРёРЅРёРјР°С‚СЊ РјРѕРіСѓС‚ С‚РѕР»СЊРєРѕ РіСЂР°Р¶РґР°РЅРµ РџРѕР»СЊС€Рё. Aneta Figiel СЂРѕРґРёР»Р°СЃСЊ 2РіРѕ РёСЋРЅСЏ 1980 РіРѕРґР° РІ Р’Р»РѕС†Р»Р°РІРµРєРµ. РЎ 1999 РіРѕРґР° РѕРЅР° РІС‹СЃС‚СѓРїР°Р»Р° РІ СЂР°Р·Р»РёС‡РЅС‹С… РјСЋР·РёРєР»Р°С…, РІРєР»СЋС‡Р°СЏ "Miss Saigon", "Peter Pan", "Grease" Рё "Chicago". РћРЅР° СЃС‚Р°Р»Р° РїРѕР±РµРґРёС‚РµР»СЊРЅРёС†РµР№ С‚РµР»РµС€РѕСѓ "Szansy na sukses" РІС‹СЃС‚СѓРїР°СЏ СЃ РіСЂСѓРїРїРѕР№ IRA. РџСЂРёРЅРёРјР°Р»Р° СѓС‡Р°СЃС‚РёРµ РІ С„РµСЃС‚РёРІР°Р»Рµ РІ РћРїРѕР»Рµ, РІС‹СЃС‚СѓРїР°СЏ РІ РґСѓСЌС‚Рµ СЃ Marzena Korzonek Рё РіСЂСѓРїРїРѕР№ Esoka. Р’ 2003 РіРѕРґСѓ РїСЂРёРЅСЏР»Р° СѓС‡Р°СЃС‚РёРµ РІ РїРѕР»СЊСЃРєРѕРј "Р�РґРѕР»Рµ" Рё РґРѕС€Р»Р° РґРѕ С„РёРЅР°Р»СЊРЅРѕР№ РґРµСЃСЏС‚РєРё. Р’ 2006 РіРѕРґСѓ РІС‹РёРіСЂР°Р»Р° РЅР° РєРѕРЅРєСѓСЂСЃРµ "Przebojem na antene", РѕСЂРіР°РЅРёР·РѕРІР°РЅРЅРѕРј РїРѕР»СЊСЃРєРёРј СЂР°РґРёРѕ. Dziewczyny Р±С‹Р»Рё РѕСЃРЅРѕРІР°РЅС‹ РІ 2008 РіРѕРґСѓ РёР·РЅР°С‡Р°Р»СЊРЅРѕ РєР°Рє РґСѓСЌС‚ Anna Karamon Рё Aleksandra Novak СЃ Р°РєРєРѕРјРїР°РЅРёРјРµРЅС‚РѕРј РіРёС‚Р°СЂРёСЃС‚Р° Krzysztof Lochowicz, РїРѕР·РґРЅРµРµ Рє РЅРёРј РїСЂРёСЃРѕРµРґРёРЅРёР»РёСЃСЊ Рё РґСЂСѓРіРёРµ РјСѓР·С‹РєР°РЅС‚С‹. РћРЅРё РїСЂРёРЅРёРјР°Р»Рё СѓС‡Р°СЃС‚РёРµ РІ СЂР°Р·Р»РёС‡РЅС‹С… РјСѓР·С‹РєР°Р»СЊРЅС‹С… С„РµСЃС‚РёРІР°Р»СЏС…. Р’ РјР°Рµ 2009 РіРѕРґР° РґРІР°Р¶РґС‹ РѕРґРµСЂР¶Р°Р»Рё РїРѕР±РµРґСѓ РІ РїСЂРѕРіСЂР°РјРјРµ "Hit Generator" С‚РµР»РµРєР°РЅР°Р»Р° TVP 2 Рё СЃРµР№С‡Р°СЃ СЂР°Р±РѕС‚Р°СЋС‚ РЅР°Рґ Р°Р»СЊР±РѕРјРѕРј "Dziewczyny z sasiedztwa", РєРѕС‚РѕСЂС‹Р№ РІС‹Р№РґРµС‚ РІ РјР°СЂС‚Рµ 2010 РіРѕРґР°. Anna Cyzon - С„РёРЅР°Р»РёСЃС‚РєР° РљР°РЅР°РґСЃРєРѕРіРѕ Р�РґРѕР»Р° Рё РІРµРґСѓС‰Р°СЏ MTV РљР°РЅР°РґР°, РіРґРµ Р±СЂР°Р»Р° РёРЅС‚РµСЂРІСЊСЋ Сѓ СЂР°Р·Р»РёС‡РЅС‹С… РєРёРЅРѕР·РІРµР·Рґ. РћРЅР° СЂРѕРґРёР»Р°СЃСЊ РІ РљСЂР°РєРѕРІРµ Рё РїРµСЂРµРµС…Р°Р»Р° РІ РљР°РЅР°РґСѓ СЃ РµРµ СЂРѕРґРёС‚РµР»СЏРј, РєРѕРіРґР° РµР№ Р±С‹Р»Рѕ 6 Р»РµС‚. Р•Рµ РґРµР±СЋС‚РЅС‹Р№ Р°Р»СЊР±РѕРј РіРѕС‚РѕРІРёС‚СЃСЏ Рє РІС‹РїСѓСЃРєСѓ РІ 2010 РіРѕРґСѓ. VIP Р±С‹Р»Рё РѕСЃРЅРѕРІР°РЅС‹ РІ 2003 РіРѕРґСѓ Рё СЃРѕСЃС‚РѕСЏС‚ РёР· С‚СЂРµС… РјСѓР·С‹РєР°РЅС‚РѕРІ РёР· Р–РµС€СѓРІР° Mariusz Dlugosz, Tomek Tebin and Andrzej Ruzzal. РЈС‡Р°СЃС‚РЅРёРєРё РіСЂСѓРїРїС‹ РёРјРµСЋС‚ Р±РѕР»СЊС€РѕР№ РѕРїС‹С‚ СЃС†РµРЅРёС‡РµСЃРєРѕР№ РґРµСЏС‚РµР»СЊРЅРѕСЃС‚Рё, Р·Р°СЂР°Р±РѕС‚Р°РЅРЅС‹Р№ РІРѕ РІСЂРµРјСЏ СѓС‡Р°СЃС‚РёСЏ РІ РіСЂСѓРїРїР°С… Latami, Ninie Walking Trees, Tea 4 Two, Varieze, Ptaki, K-15. РћРЅРё Р·Р°РїРёСЃР°Р»Рё РєРѕРІРµСЂР° Depeche Mode РґР»СЏ С‚СЂРёР±СЊСЋС‚ Р°Р»СЊР±РѕРјР° "Master of Celebration" Рё РІС‹РїСѓСЃС‚РёР»Рё РІ 2005 СЃРѕР±СЃС‚РІРµРЅРЅС‹Р№ Р°Р»СЊР±РѕРј "Nie wiem...". Nefer Р±С‹Р»Рё РѕСЃРЅРѕРІР°РЅС‹ РІ 2006 РіРѕРґСѓ. Р�С… РѕРґРЅРѕРёРјРµРЅРЅС‹Р№ РґРµР±СЋС‚РЅС‹Р№ Р°Р»СЊР±РѕРј Р±С‹Р» РІС‹РїСѓС‰РµРЅ 28РіРѕ СЏРЅРІР°СЂСЏ 2008 РіРѕРґР°. Р’ РёСЋР»Рµ 2008 РіРѕРґР° РіСЂСѓРїРїР° РІС‹СЃС‚СѓРїР°Р»Р° РЅР° СЂР°Р·РѕРіСЂРµРІРµ РЅР° РєРѕРЅС†РµСЂС‚Рµ РђРІСЂРёР» Р›Р°РІРёРЅСЊ РІРѕ Р’СЂРѕС†Р»Р°РІРµ. Р”РѕРїРѕР»РЅРёС‚РµР»СЊРЅР°СЏ РёРЅС„РѕСЂРјР°С†РёСЏ Рѕ РІС‹Р±СЂР°РЅРЅС‹С… РёСЃРїРѕР»РЅРёС‚РµР»СЏС… РґРѕСЃС‚СѓРїРЅР° РЅР° СЃР°Р№С‚Рµ TVP (РЅР° РїРѕР»СЊСЃРєРѕРј). РЈС‡Р°СЃС‚РІСѓСЋС‰РёРµ РїРµСЃРЅРё РјРѕР¶РЅРѕ РїСЂРѕСЃР»СѓС€Р°С‚СЊ Р·РґРµСЃСЊ. Poland: National final set for 14th of February. Submission deadline is set for November 2nd, on 9th of November list of finalists will be published, 5 to 10 artists will take part. This year, all performers should have Polish citizenship and songwriters - Polish roots. РџРѕР»СЊС€Р°: РќР°С†РёРѕРЅР°Р»СЊРЅС‹Р№ С„РёРЅР°Р» РЅР°Р·РЅР°С‡РµРЅ РЅР° 14 С„РµРІСЂР°Р»СЏ. Р—Р°СЏРІРєРё РЅР° СѓС‡Р°СЃС‚РёРµ РїСЂРёРЅРёРјР°СЋС‚СЃСЏ РґРѕ 2РіРѕ РЅРѕСЏР±СЂСЏ, 9РіРѕ РЅРѕСЏР±СЂСЏ Р±СѓРґРµС‚ РѕРїСѓР±Р»РёРєРѕРІР°РЅ СЃРїРёСЃРѕРє С„РёРЅР°Р»РёСЃС‚РѕРІ РІ РєРѕС‚РѕСЂС‹Р№ Р±СѓРґСѓС‚ РѕС‚РѕР±СЂР°РЅС‹ РѕС‚ 5 РґРѕ 10 РёСЃРїРѕР»РЅРёС‚РµР»РµР№. Р’ СЌС‚РѕРј РіРѕРґСѓ, РІСЃРµ СѓС‡Р°СЃС‚РЅРёРєРё РґРѕР»Р¶РЅС‹ РёРјРµС‚СЊ РїРѕР»СЊСЃРєРѕРµ РіСЂР°Р¶РґР°РЅСЃС‚РІРѕ, Р° Р°РІС‚РѕСЂС‹ РїРµСЃРµРЅ - РїРѕР»СЊСЃРєРёРµ РєРѕСЂРЅРё.